Fresh tomatoes, basil, butter and cream create a warm comforting bowl of soup when you make this Fresh Tomato Basil Soup Recipe. The tomato base can easily be made, creating a wonderful summer time fresh aroma in your kitchen or even better can a large batch during the peak of tomatoes season which will make it even easier to warm up to a bowl during the cold winter months. I’ve been on a hunt for quite some time for the perfect tomato soup recipe. I know I wanted it to be fresh tasting, having a hint of basil and a slight bit of chunkiness to the tomato base. Growing up my mom always used real butter and cream when she made her canned tomato soup so that was a must for my recipe also. Experimenting with ingredient combinations I have come up with the perfect fresh tomato basil soup recipe. I’m enjoying a bowl right now as I write this post mater of fact. Somebody had to eat the bowl of soup I photographed in these pictures. Fresh tomatoes, basil, butter and cream create a warm comforting bowl of soup when you make this Fresh Tomato Basil Soup Recipe. Canning the tomato base ahead during the peak of tomatoes season will make it even easier to warm up to a bowl during the cold winter months. 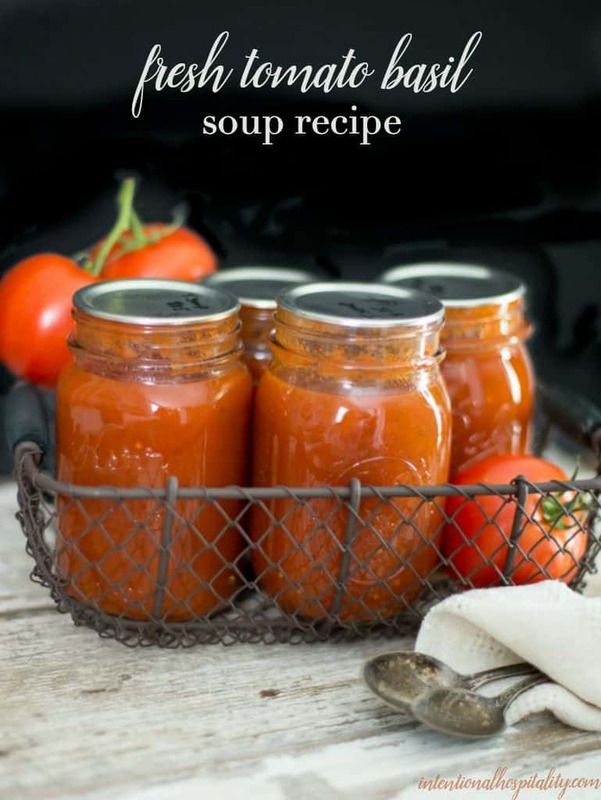 Canning your own tomato soup base is easy and delicious. PROCESS filled jars in a pressure canner at 10 pounds pressure 55 minutes for pints and 1 hour and 25 minutes for quarts, adjusting for altitude. Remove jars and cool. Check lids for seal after 24 hours. Lid should not flex up and down when center is pressed. Thanks for help in keeping our food preserving safe.